In 2010 thriller writer Brad Meltzer wrote a book that was more personal than any he’d ever written before. It was called “Heroes for My Son,” a collection of essays in tribute to dozens of men and women he thought would make excellent heroes for his own sons. And she wanted a book of heroes, too. 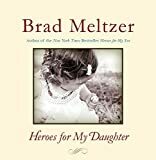 Calling on inspiration a second time, Brad Meltzer now has come out with a volume called “Heroes for My Daughter.” Like its predecessor, this one contains the stories of many of the “usual suspects,” like Eleanor Roosevelt and Amelia Earhart. But you’ll also find Tina Turner, Lisa Simpson, and the Three Stooges in here.